This is an income received for a specific period or for the life of the annuitant. A private individual with a lump sum can acquire a purchased life annuity where part of the income is classified as the repayment of capital. Also a Trustee can acquire pension annuities for the benefit of an annuitant, to provide a pension income at retirement age that will be taxed as earned income. For maturing pension rights there will be an opportunity for the scheme member to select an open market option. This means that the annuity purchased could be from a provider other than the existing pension fund provider in order to secure the best pension annuity or With Profits annuity at retirement. If in any doubt, the annuitant must seek an annuity and pension bureau offering specialist advice from an IFA (independent financial adviser) that has the qualification K10 (retirement options). The annuitant could take a tax free lump sum. With the balance of a pension fund the annuity is dependent at least in part on the prevailing interest rates at the time and also on the annuitant's age and mortality. By purchasing an annuity the individual will participate in the mortality profit that is partly distributed by providers to annuitants. For a family with an elderly relative that now requires 24 hour care after suffering an illness, the long term care costs for a nursing home could be partially funded, after any contributions by Local Authority or NHS funding, by an immediate needs annuity. 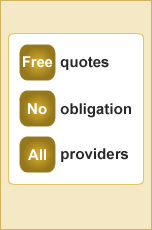 The annuitant can use their open market option to find the best annuity quote on the market. It is unlikely that the provider of the pension fund will also be competitive in the specialist annuity market, even though the existing provider is obligated to offer annuities. Annuity quotes can differ significantly and pension annuities from the best provider could be up to 30% higher than that offered by the existing provider. A standard quote is designed for people in good health, however, If the annuitant or their partner is currently ill or has suffered illness in the past or are a smoker or are overweight, they could qualify for an enhanced annuity or even an impaired life annuity. Alternatively, if the individual has other sources of pension income and is prepared to accept a higher risk than standard annuities, they could consider a With Profits annuity. Over time a With Profits annuity has the potential to generate more income as the annuitant can benefit from bonuses added due to higher returns on assets. Annuity quotes can also be offered if an individual has a lump sum and requires a guaranteed income for the rest of their life. In this case they can buy a purchase life annuity where part of the income represents a return of capital and only the income element of the annuity is taxable. The quotes offered by life companies for annuity rates vary considerably and change frequently. This is because some providers specialise in offering annuity products. They could provide the whole range or specific types of annuities such as a compulsory purchase annuity (or pension annuities), purchased life annuity and impaired or enhanced annuity for both pension and life products. Other specialist providers would offer rates where an elderly relative now requires 24 hour care after suffering an illness. the long term care costs for a nursing home could be partially funded, after any contributions by Local Authority or NHS funding, by an immediate needs annuity. The provider can use the annuity market to balance their overall liabilities. Many providers only offer very competitive annuity rates when they need to improve cashflow, as annuities can attract tens of millions of pounds per month to a single insurance company. Providers with significant financial strength can also offer a With Profits annuity and the annuitant could select an Anticipated Bonus Rate (ABR) that produces higher income than the standard annuity. When making a pension annuity purchase the individual has the option to search for the highest annuity rates using an open market option, however, learn more about annuities, compare annuity rates and before making a decision at retirement, secure a personalised annuity quote offering guaranteed rates. All individuals retiring with appropriate pension rights can commute part of the pension fund to a tax free lump sum before buying an annuity. The compulsory purchase annuity (or UK pension annuity) acquired by a pension fund is taxable as earned income although annuities are not subject to national insurance contributions. Any tax free lump sum not commuted will provide an extra income but will be taxable at the annuitants marginal rate of tax, 22% for a basic rate taxpayer or 40% for a higher rate taxpayer. It is also possible to take the tax free lump sum and acquire a purchased life annuity where part of the annuity is treated as a return of capital and therefore tax free and the balance is taxed at the 20% savings income rate. This would greatly reduce the tax paid by the annuitant and therefore increase the pension income for the life of the annuitant. Where an immediate needs annuity is purchased for an elderly relative that enters a nursing home, the long term care costs are paid by the provider direct to the nursing home totally free from any taxation. For the purpose of valuing future pension payments, a rate of interest based on the annuity interest rate (AIR) is used. The AIR reflects the yield to redemption on high coupon medium and long term gilt edge securities and is reviewed quarterly by the Personal Investment Authority (PIA). The AIR will have an impact on the critical yield such that a higher annuity interest rate would reduce the critical yield, discounting future pension payments at a higher rate and result in a lower capitalised fund value needed to provide a given pension income at the retirement age for the scheme member. An individual at retirement could select a conventional guaranteed annuity or, if they are prepared to accept a slightly higher risk, a With Profits annuity. The income from a with profits annuity is dependent on the underlying allocation of the With Profit assets so the income can go down as well as up. At the outset the annuitant can select the Anticipated Bonus Rate (ABR) of between 0% and 5%. This represents an expectation of the bonuses that will be allocated by the life company over the following year. The higher the ABR, the higher the initial income paid. If the bonuses actually declared are less than the ABR, then the annuity income in the future will fall. It follows that if the bonuses are higher than the ABR, then the future income will increase. Whether this would happen would in part depend on the financial strength of the provider and their ability to keep bonuses above the ABR, even in poor market conditions. To increase security for the annuitant, some providers have introduced a guaranteed minimum income for a With Profits annuity below which the income from the annuity cannot fall, and this assumes the Anticipated Bonus Rate is set at 0%. This is a personal pension plan that an individual can use for contracting out of the state earnings related pension scheme (SERPS) and is known as an appropriate personal pension (APP). This plan will build-up benefits where the pension income at retirement will be dependent on the contributions made and investment return. Under section 590 of the Income and Corporation Taxes Act 1988 (ICTA 88) an approved scheme must receive approval from the Pension Schemes Office (PSO). The strict conditions of approved schemes as set out by ICTA 88 means most employer pension schemes will seek more flexible benefits through an exempt approved scheme granted by the PSO under the occupational pensions scheme practice notes (IR (1997)). An approved scheme will be granted approval if: it is established under irrevocable trust; the scheme, company and administrator must be resident in the UK; the employer pays at least 10% of the total contributions; the contributions and benefits are within Inland Revenue maximums; no pension income will allow total commutation to a tax free lump sum; the maximum retirement benefits payable to the scheme member or as a widows pension can exceed the 1/60th accrual rate; and the eligible employees must be informed in writing of the terms and conditions of the scheme. Unlike private sector companies, the Armed Forces Pension Scheme is designed to meet the special requirements of service life, where youth and fitness are essential elements of the occupation. This means that the scheme will provide immediate pension benefits to may of the members that leave early and full retirement benefits can be earned by the age of 55. The final value of the retirement benefits will depend on the members years of service and rank, which will determine the members pensionable earnings. Due to the special nature of the armed forces, the pension scheme rules are set out in prerogative instruments with authority from the Queen rather than approval by parliament. An employee can receive earnings, be a pension scheme member and accrue retirement benefits from two or more associated employers. The practice notes issued by the Pension Schemes Office (PSO) define associated employers as a company that is directly or indirectly controlled by the other or both companies are subsidiaries controlled by another company. For the employee the transfer between associated employers is seen as continuous service in relation to their members pension rights, whether this involves a switch of companies while remaining in an employers pension scheme or leaving pensionable service of one scheme for another within the same employer. The Inland Revenue will establish the employees maximum benefits by combining total benefits from both employers. Whereas post-89 members are subject to the earnings cap on their relevant earnings, pre-87 and pre-89 members with continued tights will be able to maintain their retirement benefits under those tax regimes. Under section 31 of the Financial Services and Markets Act 2000 (FSMA) an authorised person can be a person who has a Part IV permission to carry on one or more regulated activities as: an EEA firm qualifying for authorisation under Schedule 3 of the FSMA (EEA Passport Rights); a Treaty firm qualifying for authorisation under Schedule 4 of the FSMA (Treaty Rights); and a person who is otherwise authorised by a provision of, or made under, the FSMA. Produced by the Office for National Statistics (ONS) the surveys used to determine the average earnings index (AEI) were started in 1963 covering Great Britain and included mainly production and agriculture industries. In 1976 the AEI was extended to include service occupations and in 1989 it added business services, higher education and research. Today the AEI survey collects data monthly and is based on a sample of 8,500 employers across 26 industry groupings in the manufacturing, services and production industries. The sample consists of employed individuals of companies in four employee size strata of; 20-99; 100-499; 500-999; and 1,000 or more. The sample is not representative of the economy as a whole as it excludes companies with less than 20 employees and earnings of self employed individuals. Every year 20.0% of the employers in the smallest three strata are replaced with new companies. The average earnings index surveys includes data collected on employee numbers and their total pay as you earn (PAYE) income including pay award arrears, bonuses, commission and overtime payments.